I would like to nominate Betty Anne Lever for the Award of Excellence in the Arts. Betty Anne has been involved with Dufferin Youth Arts festival for 19 years. She told me she got involved because it provided our kids with opportunities in the arts that they might not have otherwise. Hearing bells, seeing a band play were opportunities they could experience at this festival. Blessed with the gift of music and arts she has always shared these gifts with the students and staff she works with. Working alongside Betty Anne for 17 years, she has inspired me in so many ways. She always provides me a new perspective and a fresh way of seeing things. Without Betty Anne, I might not have been involved with the festival. Her confidence in her gifts and how she shares them has taught not only me, but also the students anything is possible when you put your heart into it. Lois Hogeveen. I met Tom Wisnicki during a district review process at my school in the fall of 2014. That day I shared with him the hopes of having Dufferin Peel Catholic District School Board as a sponsor for the festival. We talked about possible ideas of ways our board could contribute such as visual art displays. After that initial meeting I met up with Tom at a school board event at his school Robert F. Hall. He quickly made me feel welcome and was happy to share the great accomplishments in the arts that were beautifully displayed around us in the halls. He spoke proudly of the dedication of his staff and students. I left that evening feeling proud as well that we send our students along to Robert F. Hall. I left thinking “Wow those kids are going to be really lucky to have such wonderful opportunities before them”. Visiting the festival visual art show I was blown away again by the variety, creativity and effort by all the schools. When clean-up day arrived I saw Tom carefully taking down his schools art and again thought “wow, this is a great guy, a great administrator and a fantastic supporter of the arts”. I am so thrilled that Robert F. Hall contributes to the festival and so many ways and that they have Tom there supporting them. The following remarks reflect text sent in by colleagues of Tom Wisnicki at Robert F Hall SS in support of his nomination for the DYFA Educator Award of Excellence in the Arts 2016 nomination. Tom Wisnicki has been a wonderful support for the Visual Arts department. Tom frequently has entered classes and engaged in meaningful dialogue with art students. He has actively taken part in class critiques and provided his input on many occasions. Students have greatly benefited from his insight. He has personally met with individual art students and congratulated them on their artistic achievements. Most recently, he has been instrumental in the transportation of artworks to their featured destination. I would strongly recommend Tom Wisnicki for the DYFA Educator Award of Excellence. Mr. Wisnicki exemplifies everything that defines the ARTS! He is very supportive in all the events in and out of the school pertaining to Visual Art, Music & Drama. He is always willing to lend a hand and realizes the positive relationships developed and fostered by students participating in the arts! We always look to those with the courage and vision to lead. We look to leaders like Mr. Tom Wisnicki. Tom motivated and supported THE LAUNCH OF a brand new World Religions course in the Religion Department with an art focus. It is a new and innovative grade 11 course that will complement the Arts Specialist program and appeal to students interested in the arts field. It is the first course in our school board that will do this! Mr. Wisnicki shows his support for the Arts at Hall by attending the art presentations in the school. By participating as an audience for dramatic productions, music concerts, and art shows, he reveals to the Hall community that he cares about the commitment that the students show to the Arts. Ann McAlpine has supported and contributed to the DYFA for many years as a parent, teacher, administrator and now as the coordinator of DYFA volunteers. This involves organizing the large number of DYFA volunteers necessary for each day of the festival; no easy task. Ann contacts the volunteers and has sends them the necessary information to prepare them for the day’s events. Ann matches the volunteers’ talents and expertise with the work that needs to be done. Ann’s thorough organization and calm presence at the DYFA helps the entire process to function smoothly. Her warm and welcoming spirit adds to the positive atmosphere of the festival. She interacts wonderfully with all members of the community. She has been a great asset to DYFA. Ann herself has a passion for the arts, in particular music, and loves playing the piano. She and her husband Jamie attend and support many community arts events. She presently organizes the annual “Spirit Touches ART Touches Spirit”; a celebration and showcase of local artists and varied artistic genres. This is the second year that the event has been held at Trinity United Church in Shelburne. It’s a wonderful way for the community to experience the arts! Our DYFA Excellence in the Arts Ceremony – 4 pm in the Princess Margaret Public School library April 27th – recognized Tom Thompson and Lois Hogeveen as educators, and DYFA volunteers extraordinaire Ryan Grist and Bernadette Hardaker. Please accept my recommendation for this year’s DYFA volunteer award to be Bernadette Hardacker. As you well know, Bernadette has been our Master of Ceremonies for the past years . (How many, I don’t know, as I can’t remember when we haven’t had the privilege of her wonderful, positive energy and sense of humour). I have been attending the festival with my students since it began, and Bernadette ensured that the mornings we attended went smoothly, one performance transitioning into the next. She has contributed in countless ways to the festival, but most importantly, her time. Mrs Norgaard’s remarks concerning Mrs. Lisa Longstreet as recipient of the Teacher Award for the Award of Excellence in the Arts. Not only is Lisa an accomplished musician who sings and plays the piano and guitar, but she has also devoted herself tirelessly to promoting the Arts at St. Benedict School where she has taught for the past 15 years and previously at St. Andrew School. Her love for music and drama shines forth and inspires her students and fellow teachers. Lisa wrote the St. Benedict School Song which is proudly sung at all school functions. She teaches the Intermediate Choir at weekly practices and at performances at liturgies and school functions. Every year, she organizes a Christmas play at which every class in the whole school participates by singing, acting, helping backstage or with set design. Every second year, Lisa leads the Intermediate Department in producing a major theatrical event in May. She loves to bring a group of students to present a segment from this play at the Dufferin Youth Festival of the Arts. These have included Lion King, Wizard of Oz, Oliver, Willy Wonka Junior, Fiddler on the Roof, Seussical the Musical, and Tom Sawyer. Lisa has been supporting the DYFA since its conception and has encouraged many students and teachers, including myself, to get involved. Her enthusiasm is contagious and her obvious enjoyment and positive attitude bring out the best in her students. She loves being able to give the students a chance to perform in a non-competitive setting and the opportunity to see such a variety of performances by students in other schools. On a personal level, Lisa plays and sings at her church, as well as at school and family functions. She displayed her vocal talents at a recital at the Orangeville Theatre in the Spring of 2003 following a session of vocal lessons. She is always eager to further develop her own talents and skills and she humbly shares them with the community. We are gathering this afternoon to recognize our newest DYFA category of excellence in the arts in our county –the volunteers who link arms with us to support festival work. This initiative was suggested by career educator, Donna Norgaard, who was recognized as an exceptional teacher 3 years ago. After her award ceremony, she wrote us to suggest recognizing exceptional DYFA volunteers as well. We did so for the first time two years ago. That year festival volunteer extraordinaire Kathy Ayliffe and Pam Claridge were named. Last May we saluted Elizabeth Campbell, our DYFA registrar and Noelle Klassen, the web site founder and designer. The establishment of a time to say thanks to those volunteers who support the school based arts – it’s a value everyone here, present this afternoon, knows in their hearts …a part of our story…what you believe in. And what you believe is worth your time; your life time …and our beliefs determine our passions and possible contribution. This afternoon we honour Susan Moritz and David Nairn. Yes, I believe there needs to be a moment when someone says thanks. Moments when someone says thank you for making a difference for the good. That is why we are gathered here today. We have much to be proud of in this. These two volunteers /personalities in particular, have stood with us since our early years to enable a celebration of the school based arts that spans public, separate, French, home schooling and private school sectors. As much as those who have been involved from the start are amazed that this was our privilege – we are also aware one day that having been at the festival will have a different and deeper meaning for the thousands of young people who have this arts learning experience as part of their education – as they embrace life, and their unique role as emerging adults in Canadian society. It is my pleasure this afternoon to recognize David Nairn as an exceptional personality within the arts in this community. The first time I met you David your Theatre Orangeville office was in a little room up the steep steps to the second floor of the building we now know as the 199 restaurant. You were new to this town, and you listened as I asked you if you’d write a paragraph for the festival newsletter. I must say that I sensed something tentative in your spirit as if you don’t know for long you could commit to this town – you were probably coming fresh from starring as Thenardier in Les Mis. Perhaps this was a stepping stone to other things down the line in your career. Yet you stayed. What fascinates me is you now appear at ease here. You’ve accomplished things in the arts only perhaps possible when someone is in it for the long haul. You have had remarkable people like Marilyn Logan at your side to bring see the best, bring out the best in Theatre Orangeville projects. And as I put it, perhaps you’ve realized the singular impact a person has in their unique calling to impact their community for good. You are now in your 11th season as Artistic Director of Theatre Orangeville. You have brought many plays to the stage – some of my favourites have been The Giant’s Garden, Little Women – The Musical, Billy Bishop Goes to War. Just saw Queen Milly. Oh how I remember Colours in the Storm. And under your leadership Theatre Orangeville is now one of Canada’s premier venues to showcase new Canadian plays. Since I have seen most every play you have presented I am quite aware of the values and themes you support and speak to. I know you believe that theatre has the power to enthuse vital and vibrant community. We know you believe that theatre has the potential to change lives and our world. Our society is known of course for its accomplishments yet above all I believe the standard by which contribution is revealed – is how we serve those around us. How we in particular we empower people who are disenfranchised or have had little voice. I deeply respect you for your role and Marilyn’s Logan’s role in Theatre Orangeville’s partnership with Community living – I believe, in this, you have been a player in an honourable story above all. You will also be known for your willingness to dream the dream in another circle of influence – the DYFA. You threw your hat in the ring some 12 years and took the emcee profile into some thing nearly magic. As an actor, you looked out at the audience of 500 and did what it took to make it a dynamic and hilarious experience. You have teamed now with Bernadette and when children write us about their festival impressions, often you are mentioned. Your completely get why we do what we do. You completely get what it would take to make this celebration of the school based arts into a dynamic and fast paced celebration that no one forgets. I’ve been caught not knowing exactly how to describe you in all of this, are you a volunteer, or a gift from Theatre Orangeville –besides categorises and semantics – it is time this year to recognize you and thank you. Time to put your name on a plaque! It will mark you as someone who serves in their area of giftedness for the education community – to breathe energy, presence and impact into student’s arts education. David, we thank you! When I think of an individual who has had outstanding influence as an Arts Advocate, Educator and Mentor in our education community, I think of Rosanne Collis. I would like to nominate Rosanne Collis for the Award of Excellent in the Arts Award for 2013 not for her involvement with DYFA but for over 25 years of unbelievable commitment as a drama educator. We have had four years of music winners and I truly believe that to teach someone to be able to “Shine on Stage” is just as important as to teach students to play an instrument or sing in a choir. Drama is an important tool for preparing students to live and work in a world that is increasingly team-oriented. Rosanne has that special gift. She is able to provide a safe and inviting environment where her students from grade 9 to 12 can gain confidence, be creative in endless ways, improve their communication skills, learn to work with the audience, problem solve, work as a team and so much more. Many of her students have ventured into performing after High School, while others have taken what they have learned in those drama classes and productions to help them succeed in their chosen careers. Rosanne is loved, respected and trusted by her students, her colleagues and by the parents of the students she has taught. She is constantly mentoring others and she is always willing to lend a hand. A few years ago students from Princess Margaret used the drama room for their production. She was there for the dress rehearsal and our two shows- just to be supportive and helpful. Every year, she teaches a production class where the students must create the plot, write the play, audition for the roles and perform the play. Countless hours are spent getting her students ready to present several shows for High School Students, the Feeder School students and the public. She is an inspiration for her students and for the field of drama. Our daughter Emma and nephew Jono were in one of Rosanne’s production class play last year and I know that experience made them better people. And the experience was one of their highlights of High School. As a grade 8 teacher, I see the impact Rosanne has on her students on a regular basis. When the students come back to visit their old elementary school- they are filled with confidence, excitement and passion for acting. Rosanne does make a difference every day. Rosanne can help turn a student around to become more successful in not just drama but for the other courses. She helps engage her students; so they have a reason to want to go to school. It is seemly amazing! Teaching drama everyday would not be an easy task. Rosanne makes it work through her compassion, her structure of her classes, her passion for performance, her kindness and her creativity. Her influence as a Drama Educator, advocate and mentor are definitely outstanding. When I nominated Shirley Gerhard I talked about what I knew about her background with DYFA and something about some of the things she is involved in, both inside and outside the school. I also talked about Shirley being a person of her word and how this award comes at time in her career when she has made choices to persevere in her support of the arts in the school community and within the festival, despite reduced mobility and fewer work hours. Now let me tell you a little bit about her background. Shirley came to piano at age 13, following a friend who was taking lessons and she finally rallied the courage to ask her parents if she could take lessons. Her dad, who was an insurance adjuster, found a used piano at a fire salvage sale for $400. It was not damaged and Shirley still has it. She began lessons with Mr. Miller, the organist at the Baptist Church, who going blind, would teach her for free if her Dad gave him a ride to the house. By the age of 16 she was filling in as the organist. This gives you an idea of her work ethic and the work she put into her practice! After moving to Marathon she practiced on a piano in the local church until her parents shipped the piano north. There they had a large choir and Shirley was the accompanist. In Terrace Bay they had a “Festival of the Arts” and it was there that stage fright almost ended her playing forever. Luckily for us, although she still dreads performances, she soldiers on. After moving to Brampton she taught in her husband’s school in a keyboard lab, a programme with kids with a wide range of ages and musical experience, a programme paid for by the parents’ association. After moving to Orangeville she taught from her home and became a member of the alto section at St. John’s Anglican Church, eventually taking over the role of organist/choir director. In 2000 Shirley became a part-time teacher at Mono Amaranth, working with Mary Runciman and Beryl Taylor, who got Shirley involved with DYFA. When Beryl died, Shirley accompanied Mary’s choir at the Festival. When transferred to Island Lake she teamed up with Kathy Wraye to enter a junior choir. She also found some teachers who did not want to teach music and, with help from the principal, traded some subjects. She set up a recorder programme, and the junior choir performed at the grand opening of the school. 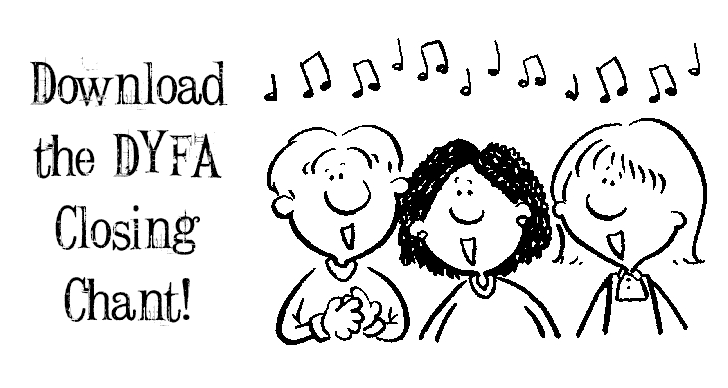 If not taking a choir to DYFA herself, she encouraged other teachers to do so. She strives for excellence in herself and in the students and sees the value of them taking part in a festival without competition. She also arranges the music and lyrics for her choir and gives encouragement to other teachers. I did not personally know Shirley until she came to St. Mark’s and joined our choir. Of course, I was delighted to get another alto, but to find someone who was not only a pianist, but also knew the Anglican service! At last, a supply organist. What a blessing! But St. Mark’s got much more than that. Shirley not only does the supply organist’s job when I talk time off, but she also volunteers with the music in the Sunday School. Then, we began a pre-service music programme. And, once again, Shirley volunteered. So for the past couple of years Shirley, Jim Coupland and I have played before the services — sometimes the two of them, sometimes Jim and myself, and usually, on Celtic Service Sundays, the three of us. It is great fun and this has led to decision that we would again start up the Taize Services at St. Mark’s, and, once again, Shirley is part of the music team. And she helps choose new music for the choir and arranges hymns for us and writes descants. The past couple of years have not been easy for Shirley, with knee and foot surgery, but through it all, as soon as she could hobble around, she was back at choir. She has done exactly the same thing at school — once she was able to move, she was back, doing what she loves most, music, encouraging young people in their artistic endeavours — and of course, preparing them for DYFA. Shirley is truly an inspiration to many of us, and I am so grateful that she decided to come to St. Mark’s and join our choir and give me a chance to get to know her. I am not only very proud to have Shirley as a colleague, but to be able to call her my friend as well. Please accept this as my nomination of Shirley Gerhard for the Excellence in the Arts Educator Award. When the co-ordinators of DYFA came up with the idea that teachers be recognized within our communities for their excellence, it was an idea whose time was right. As such it is an honour for me to nominate one such teacher, Shirley Gerhard. Not only am I aware of her reputation as an advocate and supporter of the DFYA for many years, I have known her as a musician in her own right, here in Orangeville, through her work as choir director at St. John’s Mono, through her piano accompaniment of Taize services at Mount Alverno, and now at St Mark’s Anglican Church. Personally, she has also been willing to support my work as the musical director at St Mark’s by filling in as supply organist and helping with the music with the Sunday School. It is apparent from printed programmes from previous DYFA’s that Shirley has been listed on the teacher list many times. She has prepared many school groups to perform at the festival. Yet, it is her reputation as a committed festival team player that distinguishes her as outstanding. 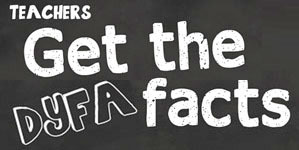 She facilitates schools involvement with the DYFA by handling the paperwork and meeting deadlines well in advance. Shirley is a person of her word. This award comes at a time in her career when she had made choices to persevere in her support of the arts in the school community and within the festival. Her personal effort is to be commended. Even during days of reduced mobility, and consequently fewer work hours, Shirley has chosen to continue her choir work at Island Lake Public School. This reveals her exceptional commitment as an educator and arts advocate within our education community and so it is with great honour that I nominate her for the DFYA Award of Excellence in the Arts Educator Award. Noelle Klassen is an artist and visionary. Noelle is also passionate about developing community. When she heard what the festival was about, she simply understood why it worth someone’s time. No one needed to convince her. When I admitted to her how inadequate I was in tracking the communication paperwork with 28 schools, she offered to develop a web site. She let her name stand in leadership when we were without a second coordinator. She created PowerPoints so the festival mornings would be organized on the jumbotron. She came to teacher rep planning sessions and made sure we had festival meeting agendas, materials, photographs of art work and celebration images projected to cheer and encourage us all on. She worked through glitches and found solutions. She understands how miraculous it is to have a chance to do the DYFA and has put her shoulder to the wheel to make it happen. She loves what she does in her church community at Compass and linked arms with us to develop relationships in community. She understands why art matters because she is an artist. She understands why student arts matter because she is a mom. We asked children to draw and talk about, their most memorable moment at the festival. Nearly a third of the boys drew the jumbotron at Compass. No visit to a school or set of thank you notes from students happens without mention of her live panning of the audience when she shows us, whose is looking at us! The students cheer her on like they are at a Jay’s game and she also knows about timing and how to bring the crowd down so there are ready to listen to the next school performance. Her work accentuates the thrill and fun of live performance. It happens because Noelle makes it happen. No one else in our leadership could offer web site design and development. No one else could develop projection design and development. Noelle had the background and vision to bring this to the celebration and words sort of fail at this point to describe her influence and impact on what has been accomplished. There is a level of professionalism and vision within the web site and projection issues of the DYFA, singularly because of Noelle. Noelle, thank you. It is my honour to nominate her for the Volunteer Dufferin Youth Festival of the Arts Award of Excellence in the Arts. It is my pleasure to nominate Elizabeth Campbell for the 2013 Volunteer Dufferin Youth Festival of the Arts ‘Award of Excellence in the Arts’. Before the first DYFA, Elizabeth recognized the benefits of a festival to celebrate arts in the schools. She provided thoughtful advice and insight during the initial planning stages. Throughout the years, she has volunteered in so many roles: welcomed and assisted schools as they arrived at the festival, assisted with the visual arts displays, set chairs for audience and performers, transported instruments, worked in the hospitality area. These are just a few of the many examples of Elizabeth’s contributions to the festival. Of particular significance is Elizabeth’s present role as the DYFA registrar. She compiles the many school registrations in to a balanced schedule of daily performances – not an easy task! She corresponds with teachers and festival representatives before constructing the final schedule. She has contributed many hours to the festival schedules; ensuring that the needs of all participants are met and that our children are provided the best opportunity to showcase their talents. I have also witnessed Elizabeth’s support of the arts programs at Mono and Amaranth Public School and Orangeville and District Secondary School. She understands the importance of the arts in life. Her children participated in the festival and then returned as young adults to volunteer. Elizabeth can be spotted playing alongside students at ODSS band rehearsals and attending concerts in our community. She assisted in the designing of the ODSS band blog and continues to maintain it. I am so pleased to nominate Elizabeth for the Volunteer ‘Award of Excellence’ 2013! In 2009, The Award of Excellence in the Arts was inaugurated by the Dufferin Youth Festival of the Arts to celebrate exceptional commitment to the arts in our education community. Nominations were tallied and Mary Runciman was awarded this honour at ceremony hosted by Principal Jim Bonter at Island Lake Public School. The wall plaque was displayed at the Program Office of the Upper Grand District School Board for six months and then featured at her home school, Mono & Amaranth Public School. 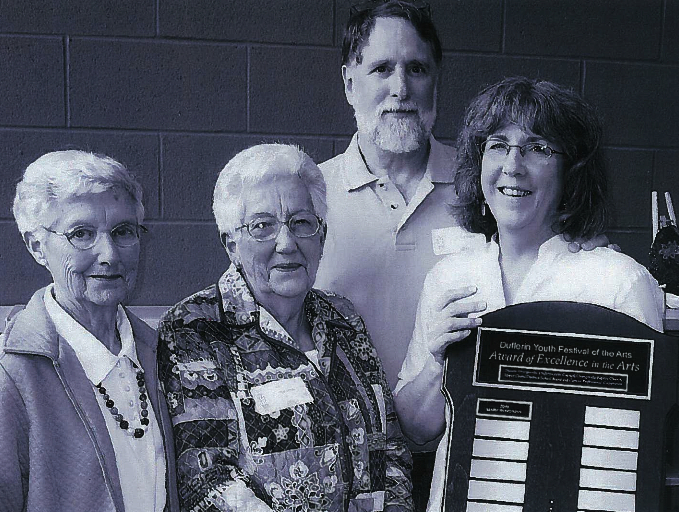 In 2010, two outstanding educators, Karen Orme and Laurie Heimbecker received the award in recognition for their outstanding influence as arts advocates, educators and mentors. In 2011, the nominations of Kim Stevenson – Montgomery Village Public School and Donna Norgaard – St Benedict Elementary School were celebrated at ceremony hosted by the School Council at Princess Margaret Public School and Principal Tom Thompson. 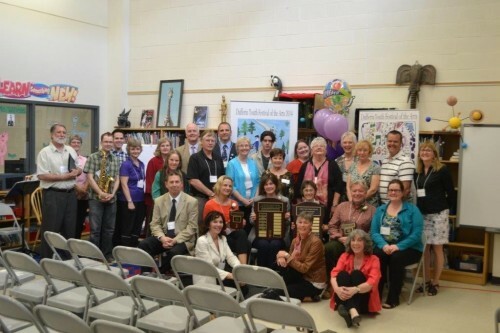 In 2012 we recognized Joyce Turek, Doug McIllwain, Kathy Ayliffe, and Pam Claridge.Once again, we thank Principal Tom Thompson and the school council and chairperson of the Princess Margaret Public School Council, Chris McCoy, for their gracious hospitality in hosting this event. Respectully we present the 2012 award winning nominations. and the vocal music program at ODSS. We have had the pleasure of Doug’s presence at Orangeville District Secondary School for 23 years now. Once in a while Doug has had to teach Geography or Careers courses but for the most part, since graduating from the University of Windsor Music program, Doug has been locked in a room 2 or 3 times a day, everyday, with a group of teenagers, teaching them music. Music theory, instrumental skills, vocal skills, beginner level or experienced – kids with grade 7 conservatory or kids who just want to learn how to play a flute or the drums, – kids who can sing like nightingales or kids who are better equipped to sing only in the shower, – trumpet, trombone, clarinet, percussion, piano or sax – it does not matter – Doug takes the students from where they are to where he wants them to be. And he exposes them along the way to a broad range of music from pop, to show tunes, to classical to jazz. Some have required more motivation than others but Doug always pushes them to improve and give their best. And over the course of 23 years there have been about 1000 musicians who have been educated in the secrets of musical performance by Mr. Mac. Listen to a Doug McIlwain music group – vocal or instrumental – and it will be well rehearsed, precise, professional and always enjoyable (well to be honest, sometimes the grade nine beginners first concert is a little rough) – but the point is Doug does get the best out of what he’s got. I am pleased that the Dufferin Youth Festival of the Arts is seeing fit to honor Doug for his involvement in bringing music to our community because for 23 years Doug has gone beyond his classroom and worked hard to ensure ODSS has a concert band. Once a week from September to June Doug holds band rehearsals after school to ensure that students who share his love of music have a chance to get together, to practice and eventually perform. And to make sure they do have an opportunity to perform, Doug has arranged school concerts twice a year – at Christmas and in the Spring – to highlight the students’ skills and give the community a chance to see and hear Orangeville’s newest musicians. But Doug’s reach goes far beyond just ODSS events. He has also taken his students to perform concerts at elementary schools, to joint concerts with our Orangeville Community Band, to festivals like the DYFA and on band trips to exotic places like Cleveland – maybe not so exotic – New York, Chicago, Boston or Montreal. With each of these adventures he has given his students a variety of opportunities to perform as musicians or to come to a deeper musical appreciation. I am delighted that Doug’s efforts and accomplishments are being recognized today. When you talk of excellence in the arts, that is what Doug is all about. His passion is music and his desire is to achieve excellence with each group he works with. - Joyce Turek is both a Primary and Junior teacher who loves teaching Music so much, that she teaches the Intermediate band at East Garafraxa year after year with enthusiasm. Joyce has participated in the Dufferin Youth Festival of the Arts for many years. She has presented musical numbers from her class, lead the school at DYAF by playing the piano and flute, encouraged us all to get involved in the Arts and of course, lead the band at each festival. If you can’t find her at recess, nine times out of ten you will find her providing extra help to a small group from the Intermediate band in portable 4 where she teaches band. Her dedication to students is so great, that she teaches music in a portable that houses four other teacher’s desks and workspaces. Joyce inspires us all to get involved, take a risk and teach in new ways so students can experience the love of the arts, especially music. One year, she even encouraged her teaching partner to play the drums in front of the school and the DYFA audience. She uses music as a vehicle to teach many other subjects and even incorporates all of our positive character traits into her music lessons and drama activities. It is with pride and pleasure that I nominate Joyce Turek for her contribution to music. Thanks Joyce for enriching our lives with your musical talents. Walter VanderVaart. Kathy Ayliffe – I would like to nominate Kathy Ayliffe for the Volunteer designation for the DYFA Excellence in the Arts Award. Kathy began volunteering at the Festival through her involvement with the Parent Council at Mono Amaranth School where her two daughters attended. For many years, she shared her artistic talents with the students at Mono Amaranth School and she helped to arrange visits by artists, musicians and actors to the school. When the DYFA started, she helped organize groups going to the festival and she was hooked! For several years, Kathy was the Coordinator of Volunteers. She spent many hours promoting the Festival and, in fact, was influential in making me aware of the scope of the Festival. Her daughters, Sharryn and Becca, shared their mother’ enthusiasm and, when she was in College, Sharryn started taking photos at the Festival. Kathy has a genuine passion for the Festival. As Kathy said, “Coming to the Festival gives you goosebumps! Once you attend a Festival, you want to come back and be more involved.” It is the whole non-competitive atmosphere that really appeals to Kathy and the fact that every child gets accepted for his/her efforts. Pam Claridge – Many years ago, (1970′s), I first met Mrs. Pamela Claridge, her husband Tom, Son – Alan and baby, Nancy. They were walking their dog down to the park. I was mowing our lawn and they complimented our garden. Not long after, at St. Marks Church, I met Pam and Family again. Pam was rehearsing the Junior Choir. Then she was rehearsing “Barbeque for Ben”, a Concert for the youth. She was and is very motivated towards our youth and all people. I was thrilled for my two daughters to be involved with her and her team. After every rehearsal it seemed the children received accolades and also milk and cookies! Pam has spent so many years volunteering for so many causes, even through Family and Personal health problems. An example, she has given so generously to the Royal Canadian Legion on Canada Day, War Veteran’s Appreciation Day and the Annual Senior’s Christmas Dinner, along with her Friends – including our Musical Youth. Later, I became a member of the Orangeville Citizen staff. This is just one of the Claridge Community Newspapers. I have been there about 25 years and continue to observe the gracious generosity that Pam lends to all. I observed that Pam spearheaded a big fund raising event to secure Theatre Orangeville a grand piano. I have found that many students received voice and music lessons, whether they could afford them or not. She has given so much that we are not aware of. As a Display Advertising representative for the Orangeville Citizen, Pam approached me to see if we could find advertisers to assist in promoting the Dufferin Youth Arts Festival event. This Festival furthers the endeavors of our youth singers and musicians in so many ways. I became fortunate to witness that Pam appeared to motivate so many to excel and to assist our youth to build more confidence within themselves. We were so fortunate to secure advertisers who believed in the Festival without question, and Pam! They have stayed aboard all these years! Words mean nothing, it is the action that counts. Just watch Mrs. Pamela Claridge! Rosemarie (Rosie) Elsdon. Good afternoon. My name is Nancy Claridge and I am pleased to be here today to say a few words about my mother, Pamela Claridge. Wendy Carter asked me to provide a bit of my mother’s background, and it was only in trying to put something to paper that I realized that it might be a difficult task to keep my comments to just a few minutes as requested. But I will do my best. In no particular order, Pamela Claridge is a wife, mother, grandmother, sister, aunt, singer, newspaper publisher, music teacher and organist and choirmaster.Reflecting on my mother’s past, it is not surprising that she is so enthusiastic about participating in the Dufferin Youth Festival of the Arts, for it is a celebration of the elements that have been so integral to her life.Not being one to brag, many people will not know the highlights of my mother’s career in and contribution to the arts. Born in Halifax during World War II and raised in Victoria, British Columbia, my mother grew up in a family that celebrated music. My grandmother was a soloist herself, and both my mother and aunt enjoyed taking music lessons during their childhood. Her early public performances were with such celebrated Canadian artists as David Foster, and she later worked with the likes of Elmer Iseler, Seiji Ozawa and Noel Edison, among others. Music featured prominently in how my parents met, and my mom continued her singing career when she moved to Ontario after her marriage in 1965, being a soloist in Toronto and participating in a number of choirs over the years. In Orangeville, she was an early member of the St. Mark’s Choral Society, the precursor to the current Orangeville Music Theatre and later was the musical director for a number of its productions in the 1980s. Over three decades, she was involved with the Orangeville Concert Association, serving as its President for a number of years. In the 1990s, my mother was a member of the steering committee that created Theatre Orangeville and she later served as its first President.Since the mid 1970s, my mother has brought the joy of music to local seniors’ residences, and she is a regular leader of the Christmas music program at the Royal Canadian Legion’s Seniors’ Christmas Dinner, which brings together various local performers of all ages every year.Some people will know my mother as a vocal and piano teacher, or simply a music teacher willing to help students of various instruments become comfortable with public performances. She has gained great pride in seeing these students excel in post-secondary music programs at Canadian universities, and even one at Julliard, or simply continue to enjoy music after the lessons are over. Others will recognize my mother as the director of a number of choirs, including the Just Friends Singers, the St. Paul’s Anglican Church Choir and the St. Mark’s Anglican Church Choir. She has also accompanied the Headwaters Concert Choir in local performances and the Great Lakes Touring Chorus for its tour of Austria.Although I have left a number of things out, I think everyone will get the idea that the arts have played an integral part of my mother’s life and she continues to gain such delight out of sharing the joy of the arts with children. As such, it was not a difficult job for Wendy Carter to persuade my mother to participate in DYFA. And so it has been for a number of years now that my mother has been involved in the communications and hospitality programs of the festival. Whether it is attending meetings, talking to teachers or classes, judging poster contests, taking care of advertising and communications, baking cookies, or twisting my arm to bake lemon squares for David Nairn, it is all done with a sense of purpose and joy.I have had the opportunity in the past to read the comments of students and volunteers about their experiences at DYFA, and I think there is a common thread to them all and that thread is found in my mother’s own experiences. DYFA is intoxicating and the excitement and pleasure that the students and audience receive from the program is contagious.I know from personal experience that it is my mother’s wish that everyone who participates in an arts program – whether it is a young student or a senior choir member – that they each get to experience the same excitement and pleasure that she has received from the arts throughout her life.Congratulations, Mom! 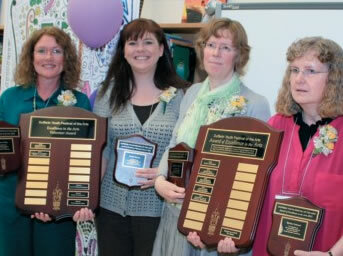 Congratulations to Doreen Norgaard and Kim Stevenson who received the Award of Excellence in 2011. I am honoured to have been asked to share some thoughts about Kim Stevenson. Impressions about the exceptional giftedness of Kim have been gathered from several sources. Some of the individuals who have shared their thoughts with me not only have known her through her teaching career, but also as musicians. Kim’s mom will tell you that Kim has always loved music. Like most children, she listened to Raffi and Sharon, Lois and Bram. She was in Karen Orme’s grade 3 choir at school, Parkinson I believe, and discovered instrumental music in grade 6. The flute was her chosen instrument. She continued with her flute in high school but it wasn’t until about grade 12 that her mom and dad realized that this was her passion. Until that time, she had never had private lessons. So, to prepare for university, Kim started taking lessons from Stan Elliotson. In her teens, Kim began playing with a local classical guitarist, Daniel Labrash. They have played at weddings and special events throughout the years. Recently, Kim and Dan have been doing some concerts together. Kim attended Wilfrid Laurier University in their music programme. She received her degree in Music Therapy and completed her internship in Edmonton, Alberta. She began a music therapy business. Some of her clients included St. Michael’s Hospital; palliative care and oncology unit, the Avalon, D.A.C.L. and Adam’s Place. The following year, Kim decided to attend U. of T. to obtain her Bachelor of Education. Her teaching career began in Grand Valley where I was the principal. This is when I first met Kim. Music was very much a part of her teaching career right from day one. You could always count on hearing some kind of music coming from Kim’s room. Unfortunately I only had Kim for one year after which she was moved to Credit Meadows. She is presently teaching music and drama to the primary students at Montgomery Village. She is self taught on the guitar and uses it daily in class. Kim’s Principal, Tracey Lindsay, would like us all to know that Montgomery Village Public School is very lucky to have such a dedicated and caring teacher such as Kim Stevenson. Kim is a good teacher – there is no doubt – she loves children and her commitment to her profession is always evident. What makes Kim a GREAT teacher is that she has a passion for music and she shares her passion with her students. Her students LOVE music – singing, dancing, making music with instruments – all of it – they LOVE when she comes to the room. We are very fortunate to have Kim who not only brings music to the classroom – she brings it to the halls, the library, the gym, in front of the school and behind the school – and sometimes on the road. Her passion for music and her expertise have translated to excitement and engagement on the part of all our students. From the staff and students at Montgomery Village – thank you Mrs. Stevenson! When you were just 16 years old you had the courage to get on stage with me and play for a large audience at the Orangeville Medieval festival. Since then we have played many concerts, recitals, gigs and charitable events. Playing music with you has been, and continues to be one of the great joys in my life. I especially appreciate the interest that you have maintained over the years in my original music. Your support has helped to inspire me to keep writing and believing in myself as a composer. We are very fortunate to have your caring presence here in our community, sharing with us, your music, creativity and laughter. Mary Runciman, a retired teacher and now one of the DYFA coordinators has shared with us many of the contributions that Kim has made to the Arts. Last year Mary accompanied Kim at the DYFA Excellence in the Awards ceremony. Kim is a musically gifted flautist. She is a valued member of Orangeville Community Band, a band lead by John Wervers, Kim’s former high school band leader. Kim is an encourager and advocate for music and the arts as shown in her daily lessons at Montgomery Village; she understands and promotes literacy through music; she attends the annual Ontario Music Educator’s Conference each year and she is always seeking ways to enrich her lessons. Mary and Kim both love music, and have worked together over the years, often sharing good ideas about teaching. My final comments come from Wendy Carter. Here is what Wendy has to say about Kim. I’m not sure I can remember a year when Kim did not bring whatever school she was teaching at, to the DYFA. There’s something simply lovely about the way she relates to her students. She obviously brings a gentle, musicality out of them. It’s clear by the rapt attention they give her, that they adore her and the material her students present, is amazing. Often teachers and volunteers remark as they leave the celebration that Kim’s classes are beautifully prepared and reflect a school arts experience that is well taught. At times, Kim further amazes me. She would send in her school’s registration with a simple closing line – Is there anything I can do to help? And these words are from a mother of two very young children. I am humbled to work with such a selfless, beautiful human being. Whatever Kim would have chosen to do as a career, she would have done well. But the fact that she chose education means she is impacting the future of children in this county in ways only an exceptional teacher can. Kim believes in her students. She has set a high bar professionally and encourages her students to meet it as shown when she teaches them the Music Monday anthems sung across Canada on the first Monday of May. As an education community we are simply blessed that she serves in the arts. The arts can engage our imaginations in ways that no other discipline can. Thank you Kim! And from all of us, in education, the community and beyond, we thank you for all that you do to bring music to life! Congratulations Kim. 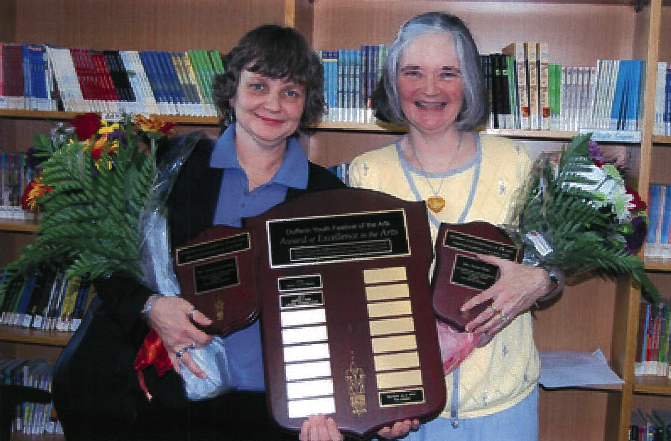 Congratulations to Karen Orme and Laurie Heimbecker who received the Award of Excellence in 2010. Congratulations to Mary Runciman on receiving the very first DYFA Award of Excellence.